Technology can unlock limitless potential for today’s church. In the last few years, I’ve noticed more pastors and worship leaders turning to tablets and phones for use when on stage, and why not? They’re smaller, easily available and provide the user quick and easy access to information. These devices also offer many time-saving benefits including the use of a handheld device as a remote for projection software. 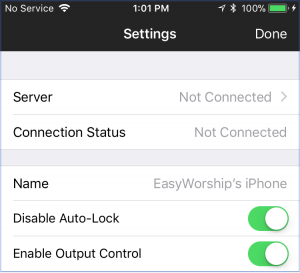 Now, thanks to Bluetooth technology and a few genius developers, EasyWorship gives you the ability to connect any of your iOS or Android phones or an iPad, using your local Wi-Fi, to the computer running EasyWorship and allows you to use that device to control the schedule remotely or to use an iPad as an output monitor. 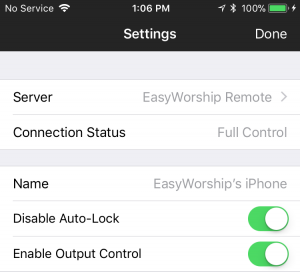 EasyWorship customers always have a number of options when it comes to presenter remotes, but the iOS and Android apps are the only ones designed with EasyWorship in mind. 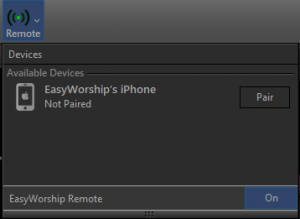 While other presenter remotes create the need for programming and tweaking just to get them to work, the EasyWorship remote app requires no set-up, other than pairing it with the EasyWorship app, and provides the user a seamless presenting experience. 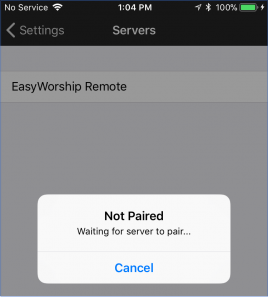 On your iPhone or iPad, go to the App Store and search for ‘EasyWorship Remote’. On the computer, open EasyWorship and click Edit > Options > Advanced. Check the box to Enable Remote Control and click OK.
On your Android Phone, go to the Google Play Store and search for ‘EasyWorship Remote’. First, make sure you have the computer and your mobile device connected to the same Wi-Fi. This allows them to “see” each other. In the mobile app, tap the hamburger icon in the top left corner. Tap the gear icon in the top left corner to open the settings. At this point, you will go to the computer and click the Remote button on the toolbar. You should see the device trying to pair under Available Devices. Click Pair. By default, it will be set to view only. To give it the ability to control the schedule, click the Lock icon next to the device name. There are also settings in the mobile app which allows Disabling Auto-Lock and Enabling Output Control. What can I do with the Remote App? Once you have your device connected to the computer, you are free to control the current schedule from anywhere within your Wi-Fi range. This is an easy setup that will produce powerful results and takes some pressure off the computer operator to help make a more fluid and distraction free service. Next Post How to Use Bright Colors In Your Song Slides, Pt 1.